Home / Readers Forum / Huawei Mate 10 Series Phones May be on Your Wishlist! 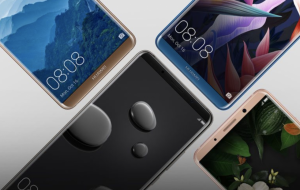 Huawei Mate 10 Series Phones May be on Your Wishlist! As we delve deep into holiday shopping there might be a new phone that you might want to take a look at or at least check out in the the store. Huawei Technologies has released their Mate 10 phone and is interested in selling it in America via AT&T. Huawei is releasing two other phones, one at a low spec and a lower price, the Nova 2, and one that is more expensive and slightly more powerful, the P10. The Mate 10 is the most advanced phone and was around $1000 on release similar to the iPhone X.
Huawei has become a international brand reaching Europe, the Middle East and other parts of Asia, but still does not have a phone market in the US. They shipped 39 million phones last year which is not that far behind Apple’s 47 million. In Shenzhen, which is the company’s hometown, people seem to use the brand as a gift for someone else but not really as a present for themselves. They go for the expensive phones, which is the Iphone based on who the New York Times interviewed. To expand their consumers they are paying Scarlett Johansson as their spokesperson in their ads and are working with Porsche and Leica on design. Vice President of Software Marketing Christopher Coutelle says that Huawei needs some PR improvements according to the New York Times interview “The brand still lacks personality. The focus is still too much on technical details and functionalities. This could be due to its network equipment business being banned in the US over beliefs that the Chinese government could use it to spy on people. Huawei also infringed on US patents, did not alert authorities before buying US companies and may have even broke trade controls with Iran, Sudan, Syria and Cuba. The New York Times article mentioned many times how Huawei is trying to compete with Apple and Samsung and really make a name for itself (with US consumers) which the New York Times feels that no Chinese company has done yet. That seems to be the biggest take away from the article: Huawei is trying to get the same standing as Apple and Samsung and it might achieve that, but the article suggested it mostly sells its low and midrange phones. With the Mate 10 series priced at around $1000 there is much doubt that those who do not know the brand would spend that much on the phone, with Apple offering a product at the same price point for a brand most Americans know. The real seller, like in other countries, may be its less expensive sibling phones that will make a mark with American consumers and the Mate 10 be there more as a symbol to show Huawei could possibly have that same standing. Ironically, as mentioned before, they are negotiating with AT&T, the company that originally marketed the first iPhone.